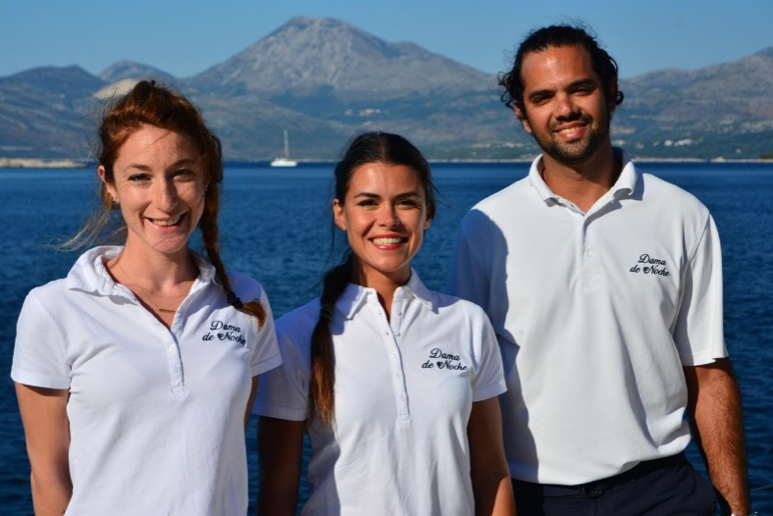 The owner of Dama de Noche, is pleased to announce that Captain Marcelo Curci Ferreira Vicente, Chef Marie Duviquet and Stewardess Maira de Mederiros Petrella have joined Dama de Noche, and after some extensive re-fit work will cross the Atlantic for the 2016/17 Caribbean season. Marcelo is a highly skilled Captain, with a lifetime of sailing experience and extensive knowledge of both the Meditteranean and Carribean. Marie is a fantastic chef, trained by a professional chef from the Cordon Bleu school, and she has developed her own style based on quality ingredients, true flavours, healthy and delicate meals for all occasions. Each location she visits is an opportunity to discover a new tastes, ingredients and techniques. Recently she has expanded her experience with a sommelier course and has also studied nutrition and diet to include more health and wellness through food. Both Marcelo & Marie look forward to welcoming guests on board for a first class charter experience.